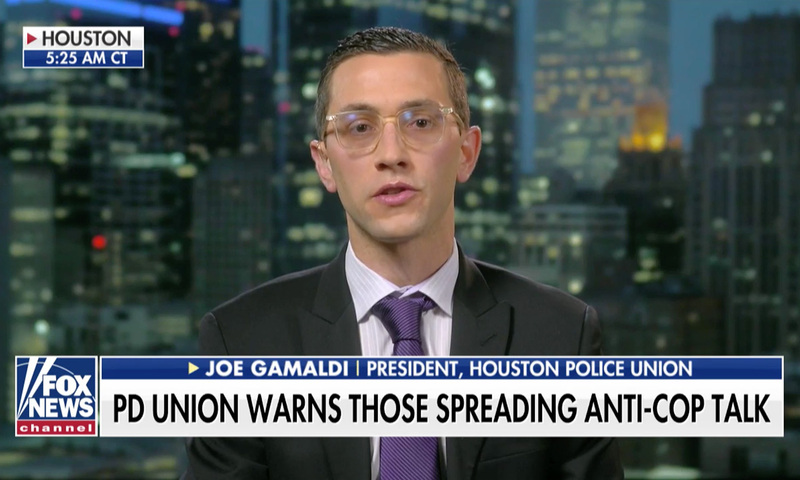 The president of the Houston Police Officers Union called out what he described as an agenda to reduce the legitimacy of law enforcement Wednesday on Fox & Friends. Joe Gamaldi’s remarks come after a shooting Monday that left five Houston Police Department officers injured. Gamaldi said at a news conference that officers are “sick and tired of having targets” on their backs, and echoed that sentiment on Wednesday. He called on all police union leaders and chiefs across the U.S. to speak up when “harmful narratives” are started against them. He also said that while holding police officers accountable is a good thing, mainstream media pundits should be held accountable too. “You know what? We are gonna hold you accountable. We’re gonna call you out when you’re lying on our officers, and we’re gonna call you out when you’re trying to drive a wedge between us and our community,” Gamaldi said. “We’re not gonna let it happen anymore. He said the response to his impassioned remarks Monday was “overwhelming” and that he was trying to vocalize the feelings of officers throughout the country. “If some of these folks got offended by what I said because I asked for accountability … you know what, if the shoe fits, go ahead and wear it,” he said. Gamaldi also said statistics don’t show a narrative that police officers have been disproportionately unfair to minorities.